The concert was held in the Diana Event Oval on October 4. Grammy-nominated musician Jorge Glem stood center stage with his eyes closed, plucking and strumming the cuatro at an astounding speed. When the last note rang throughout the Diana Center Event Oval, the crowd sat for a moment in stunned silence before erupting into applause. 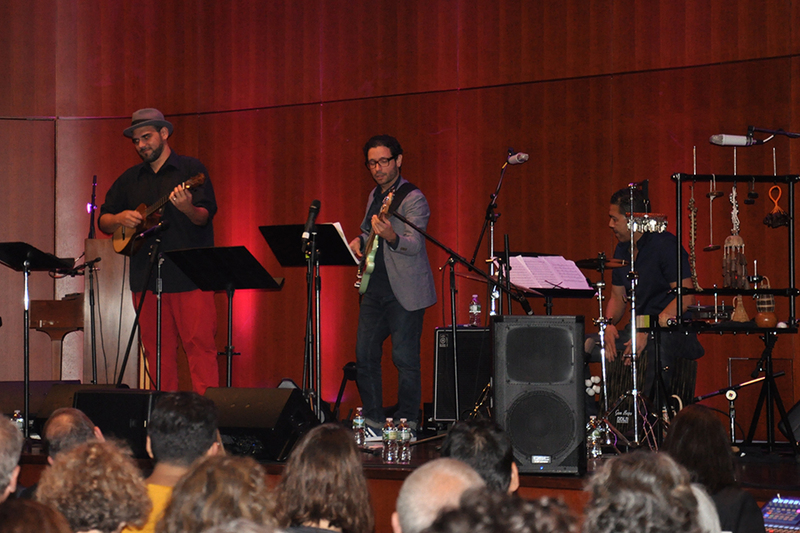 Glem was the standout performer at “Latin Jazz in the City,” a concert featuring New York-based Latin jazz artists. Hosted on Thursday evening, the concert was an initiative of the Barnard Forum on Migration and co-sponsored by the Columbia University Institute of Latin American Studies and the Center for the Study of Ethnicity and Race. While the Barnard Forum on Migration typically hosts lectures, “Latin Jazz in the City” provided a unique opportunity for the Columbia community to enjoy a concert while engaging in a cultural conversation about ethnicity, gender, and immigration. The concert featured performances of jazz interpretations of songs by Latin American female artists, celebrating creativity at the intersection of cultures. The performers onstage reflected the diversity of Latin America and its musical styles. Glem is a master of the cuatro, a Venezuelan folk instrument that resembles a small guitar. He was joined onstage by Claudia Acuña, a Chilean vocalist with a commanding presence; Puerto Rican bassist Ricky Rodriguez; Venezuelan pianist Baden Goyo; and Venezuelan percussionist Luisito Quintero, whose foot-tapping beats kept the audience on the edge of their seats, fighting the urge to stand up and dance. José Moya, director of the Forum on Migration, considers the diverse origins of Latin jazz in New York central to the Latin American identity. “[Latin jazz] is basically a creation of Puerto Ricans and Cubans in New York. It became pan-Latino music, a form of identity for people who had very little connection to their origins. It’s interesting how this product of Latinos, but Puerto Ricans mainly, became an emblem and identifier for Latin identity throughout the United States,” Moya said. Between songs, the band members spoke to the audience predominantly in Spanish, sharing anecdotes about the music they played. Classic songs by Latina singers and composers, including Violeta Parra, Celia Cruz, and Mercedes Sosa, elicited nods and murmurs of recognition from the crowd. Moya considers the Forum’s decision to present the music of Latin-American female musicians a valuable challenge to the the role of gender in the Latin jazz tradition. In addition to celebrating the diversity of Latin-American cultures and the work of female musicians, Moya hopes this concert served as a reminder of immigrants’ long-standing contributions to art and culture in the United States. “The mobility of immigrants is also the source of creativity and innovation and new things, dynamism. Very few things have come from groups that are pure, not mixed,” he said. The audience’s enthusiastic reactions suggested that Moya’s hopes were realized—resounding applause followed the conclusion of every song, and smiles covered the faces of both the audience and the performers.